Finally…a simple way to move folding tables. 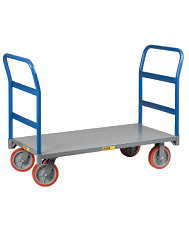 Now you can move sheet items easily using this unique wheeler. Simply lift one end of the item to be moved, roll the wheeler under the center and slip the retaining clip over the top. You can now roll the item to any location with ease. The load will remain secure and upright even when not attended. The channel accepts material thickness up to 2 ½" and is vinyl coated to protect and secure the load. Only one person is needed to move folding tables, 4' x 8' sheets of plywood, doors and office partition panels, even through doorways. A must for every department with folding tables. Wheels: 7" diameter, 1 ½" tread width. Shipping weight: 30 lbs. UPS (oversize).